Debbie Short, Meridian Technology Center Pre-Engineering Academy instructor, has been selected as a Project Lead The Way (PLTW) Master Teacher. 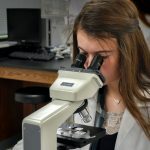 PLTW is a nonprofit organization that provides transformational learning experiences to K-12 students and teachers across the U.S., through K-12 pathways in computer science, engineering, and biomedical science programs. Short has served as a PLTW teacher in Meridian’s PLTW Pre-Engineering Academy for four years. She is a National Board Certified teacher and is qualified to teach Pre-AP Chemistry, AP Chemistry, AP Biology, Introduction to Engineering Design, Environmental Sustainability, Engineering Design and Development, and Computer Applications. PLTW’s Master Teachers are a talented and passionate cohort who play a vital role in preparing PLTW classroom teachers with the knowledge and skills needed to lead PLTW’s engaging learning experiences for K-12 students. There are currently 565 PLTW Master Teachers in the U.S.
During PLTW’s immersive classroom teacher training and beyond, Master Teachers lead their fellow teachers through the curricular content and activities and empower them to take on the role of classroom facilitator and coach. Throughout the school year, Master Teachers offer ongoing support through online Professional Learning Communities, email, and phone calls. Master Teachers also teach PLTW classes themselves. • Using reflecting as an agent for change. In addition, applicants to the PLTW Master Teacher program submitted a video demonstration, learning demonstration, and letters of recommendation. This year, PLTW selected 90 teachers from the more than 150 applicants to be Master Teachers.